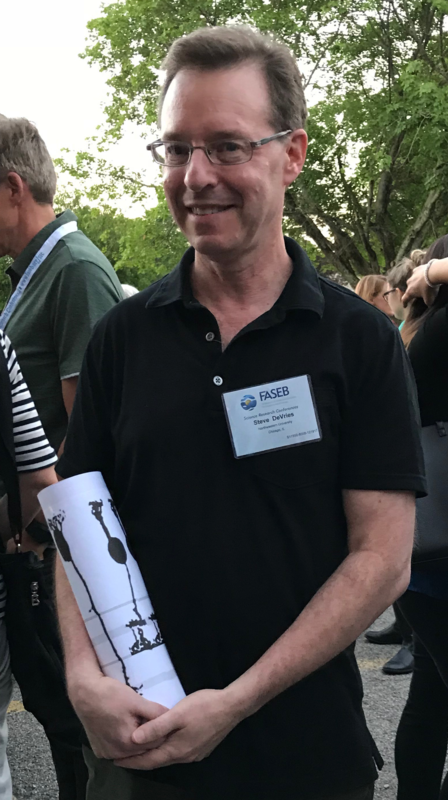 Steven DeVries, MD, PhD, the David Shoch, MD, PhD, Professor of Ophthalmology, pictured with the Brian Boycott Prize at the Federation of American Societies for Experimental Biology Science Research Conference on Retinal Neurobiology and Visual Processing. Steven DeVries, MD, PhD, the David Shoch, MD, PhD, Professor of Ophthalmology, was awarded the Brian Boycott Prize at the 2018 Federation of American Societies for Experimental Biology Science Research Conference on Retinal Neurobiology and Visual Processing. The prize is named for a distinguished British neurobiologist and honors career achievements in retinal neuroscience, with the winner chosen by a committee of prominent scientists in the field. The conference has been held every other year since 1992. “Being recognized in this way means that I am considered to be one of a small number of investigators with an influential role in shaping the present-day scientific discourse in the field,” said DeVries, who is also a professor of Physiology. His interest in retinal processing was sparked during his graduate school training at the University of Chicago, where DeVries was one of the first to identify functional “hemi-gap junction channels” in retinal neurons. A hemi-gap junction channel is a component of whole gap junction channels, which normally connect the cytoplasmic compartments of two adjacent cells. Once at Feinberg, DeVries continued to discover previously unknown mechanisms of synaptic signaling within the retina by developing a technique for measuring communication between cone photoreceptors and post-synaptic neurons including bipolar cells. Today, his work focuses on super-resolution imaging of retinal synapses, pathway tracing in the retina using rabies virus and growing 3D retinas from ground squirrel stem cells, in collaborations with scientists at Feinberg, the University of Chicago and Ritsumeikan University in Japan.